Are you coming to Europe on vacation? Or did you just move here and can't wait to start seeing some awesome places? This is part two of my best tips for traveling the continent (and the UK and Ireland), especially if you're on a budget. Check out part one about planes, trains, and automobiles here. Now let's find you a place to stay! 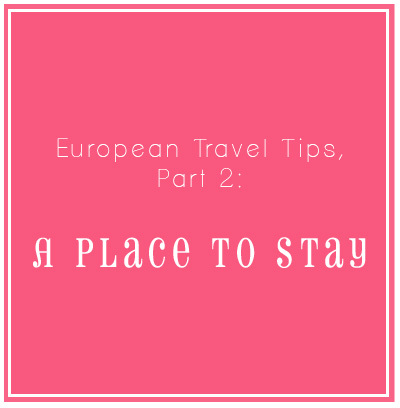 Hotels, guest houses, apartment rentals, shared rooms, hostels... Europe has it all and sometimes it can be overwhelming to sort through all of the options to find a great place to stay. And sometimes all of the planning in the world just doesn't pay off - sometimes you still get a weird hotel or it's a little dingier than the pictures online. Hey, it happens. It's Europe. Everything is old. A Tale From the Trenches: A couple of years ago my sister and her soon-to-be fiance came to visit for Christmas. Yay!, right? Holidays with the family! I was so excited to take them to the Christmas markets and to Neuschwanstein Castle so as their Christmas gift from us we got a comfortable rental car and booked hotels in Fussen and Munich for a few days. Things started well enough - Fussen is adorable and our hotel was surprisingly nice, very bright and modern. The weather was gorgeous and the castle was beautifully snow covered. Then we drove to Munich. By the time we got to Munich it was pouring rain and our hotel... our hotel was not even close to what was pictured on the website. Nor was it as close to the Christmas markets or the tram as they claimed. It was dark, a little damp (of course, we were soaked to the bone so that could account for some of the dampness), and the hotel looked straight from the pages of a 1970s Sears Home Catalog. Immediately I logged onto the internet to see if anything else was available in the city, but of course there wasn't. So what did we do? Sucked it up. The sheets were clean, the staff was helpful, and we seemed to be in a safe area. Ce la vie. is to bring your sense of humor and your sense of adventure. These things? They are just funny stories waiting to unfold. or whether you are miserable and walk away from your holiday disappointed. Ok, Ok. Moving on. Let's find you a place to stay! My favorite sites to find hotels are Booking and LateRooms, but Orbitz and Priceline work well too. I use the first two almost exclusively in Europe and can almost always find a good hotel in my price range that includes breakfast. It sounds like a small thing, but starting a day of sight-seeing with a good breakfast rocks. It's even better if I don't have to go looking for it. Always double check the price of the room on the hotels website, if they have one. Sometimes you can get the same room for less because the bigger sites take a commission. If we're going somewhere for 4 nights or more, I usually look for an apartment to rent. I've found them to be better deals if we're staying for more than just a night or two. AirBnB, HomeAway, and FlipKey are my go-to sites. A few friends use Wimdu as well, but I've never booked through them. Apartments are also a great option if you are traveling with more than two people because hotel rooms that accommodate three or more are sparse and expensive. If you rent an apartment, ask lots of questions: Are utilities included? Is the apartment private or will it be shared with someone? Is there a lift (elevator)? An air conditioner? Is there an extra charge to use the a/c? Another resource I've grown to love is the tourism website for whichever city or town I'm visiting. They usually have an accommodation section and I've scored a couple of great deals that way. If you stay at a smaller hotel, BnB, family owned guest house or rent an apartment your experience could vary greatly. Firstly, they probably don't accept credit cards and if they do they may charge you a fee to pay that way. That's pretty typical here. I actually find it to be almost universally true in Germany (Germans have an expression, "Cash Smiles," and they take it very seriously). In other countries, it's hit or miss, but don't worry - most of the hotel owners are very nice and will help you find the closest ATM and likely won't mind if you pay the next day. Secondly, they expect you to be polite. If you walk past them in the morning, say good morning. And never, never think it's ok to check out of your room by simply leaving your key in your room and driving away. Always check with the desk before you leave and wish them a good day. Ask lots of questions before you agree to a reservation and read every line of fine print. Make sure you understand what you're getting into. The lady we rented from in Rome was very upset with us because we took a wrong train and arrived several hours later than expected. There was an extra charge for that. Yes, that's normal, too. Some places don't want you to arrive too early, some charge if you come to late. Read, read, read. Ask, ask, ask. At a smaller accommodation, it is possible that the owner will invite you in for a tea or coffee. It is polite to accept. Europeans are big on social expectations - they expect themselves to be good hosts and you to be a gracious guest. Manners are very important so as my mama would say, "don't be ugly!" On the other hand, if they don't invite you in it could be because they have dealt with Americans before and halfway expect us to decline anyway. Don't take it personally. It's helpful to have your own power converters but you can ask for them when you check in. There is usually a small deposit that you'll get back when you return it. I really wanted to stay at a monastery while we lived in Europe, but that just hasn't worked out. It's certainly not for everyone, but if it sounds interesting to you check out Monastery Stays. If you've done that before, I would love to hear if you liked it! I'm already planning another trip to Italy (even though I have no idea when we'll be able to go) so let me know what you thought of staying in a religious house. And, please, let me know of any other great finds or tips & tricks you've picked up during your travels! Again, if you missed part one about Getting Around, you can read it here. And tomorrow I'll have some tips on packing your bags! Love your wise words about travelling with a sense of humour and adventure.... which leads me to think of the time my husband and I, and a group of friends stayed at a B&B in deepest, darkest Norfolk, which ended up being a known Swingers' Joint. I hasten to add, we didn't chuck car keys into a bowl nor partake of any of the extra curricula activities!!! Some of us found it hilarious, some of us didn't see the funny side! Hahaha! THAT is funny. I haven't had that one happen yet, but in Portugal we did stop for dinner one night at this restaurant that smelled amazing. After ordering, we realize the funny looks we'd received were because the only clientele (besides ourselves) was cross dressers and transvestites. Still, the food delicious and the people around us were very friendly. They thought it was funny that we didn't know.